Organizing within the food-supply chain is only going to get more important under a Trump presidency. One of the great contradictions of the American economy is that the workers who feed us are the workers who struggle the hardest to feed themselves. The corporations that produce and market America’s sustenance are also the monopolies whose low wages have pauperized a workforce of more than 21 million nationwide. And now the American diet is about to get even costlier under an administration that campaigned on cheap taco bowls and Trump-brand steaks. The “food-supply chain,” which includes production, processing, distribution, retail, and food service, constitutes the largest sector of the labor force, and has expanded by 13 percent since 2010. 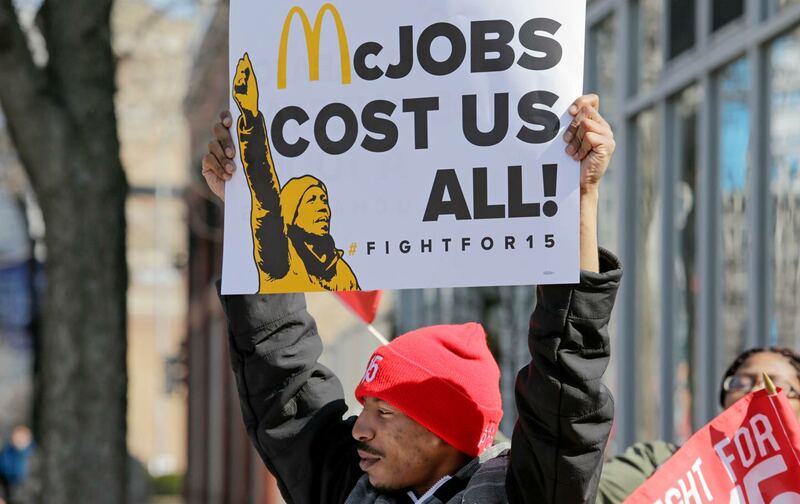 Yet food-chain workers are also the country’s poorest, typically earning just $10 an hour ($16,000 annually, less than half the median annual earnings of workers in all industries). And they’re getting hungrier, according to an analysis of food-industry jobs by Food Chain Workers Alliance (FCWA), a nationwide advocacy coalition: “Food insecurity in households supported by a food chain worker rose to 4.6 million during the Great Recession.” So those in the food labor force earn starvation wages to supply food they can’t afford to eat. Their pay scales are dictated by a race-and-gender pecking order, with white men on top. The black-white wage gap among male food-supply workers is 60 cents to the dollar. White women earn about 50 cents per dollar earned by a white man, and black, Latina, and Native women workers earn 45, 42, and 36 cents, respectively. Women in the food chain are often providers of the unwaged labor of procuring and preparing food at home; that means a mom who works for tips as a restaurant server goes home to the double indignity of going hungry so her kids can have a full dinner instead. Job segregation enforces these trends. Most food-production and agricultural-industry CEOs are white men, while women and people of color fill the ranks of the frontline workers who cook, serve, and process food. Promotion opportunities are scarce in the lower-wage tiers, in part because of the exploitation of temporary and part-time labor (half the food-prep and -service workforce worked part-time in 2014, for instance). Low unionization rates exacerbate wage inequality and discrimination, while curtailing workers’ ability to negotiate fair pay. Structural economic shifts linked to transnational trade, labor migration, and automation have made food-chain jobs more precarious on a global level. FCWA’s interviews with workers depict how these industry-wide trends weigh on workers’ lives as each day at work exposes them to toxic fumes, brutal treatment from bosses, and gender oppression. Gender-based violence and oppression, according to researchers, are rife in intensely hierarchical low-wage workplaces. In fields like food service, sexual harassment is often normalized as just a part of workplace culture—an issue that recently spurred a series of federal sexual-harassment claims against McDonald’s. All workers surveyed had been injured at work or had known a fellow worker who was, but many lacked medical insurance. Immigrant poultry-plant workers reported getting chopped by machinery and attending an on-site clinic, only to be sent back to work the same day. Under a Trump presidency, FCWA co-director Joann Lo tells The Nation via e-mail, “we expect the situation for food chain workers overall to get worse in the next four years. Particularly since we foresee discrimination against immigrants, women, people of color, Muslims, and LGBTQ workers to increase.” Trump’s camp, with gargantuan fast-food executive Andrew Puzder as labor chief, has signaled support for a litany of anti-worker policies: national “right-to-work” laws, undercutting minimum-wage standards, stacking the Supreme Court and National Labor Relations Board with pro-business conservatives, and squelching environmental regulations. Still, the work of feeding the nation can also be dignified, community-sustaining work. And organizers envision the food chain as a potential bulwark of labor power. Numerous new forms of organizing have blossomed nationwide: union drives at small restaurants, alongside nationwide union-supported campaigns like the fast-food workers’ Fight for $15 movement; coalition-building with environmental food-justice groups; and legislative campaigns in California and New York for wage and safety protections for farmworkers. Under Trump’s White House, Lo says, it’s “more important than ever to organize at the grassroots level.” But labor groups have been campaigning locally for years since Republicans took over—and effectively paralyzed—Congress. FCWA’s affiliated unions and worker centers have won various state and local measures like paid sick days and minimum-wage legislation. More importantly, workers historically isolated from unions and state protections have developed a grassroots advocacy infrastructure rooted in marginalized communities. An organizer’s insight will come in handy as labor prepares for Trumpocracy. But the working classes who form the bedrock of the food chain have spent years cultivating strategies of solidarity and resistance. They, like the president, know how to play an outside game.